Many people reach a time in their lives when they feel a need to find out where they came from and to see their countries of affiliation. For many this may be a pleasant afternoon in Scotland taking tea with a Great Aunt Mary, but for me this involved flying over the sharp Balkan Mountains and travelling to Bitola, the southernmost city in Macedonia (formerly Yugoslavia). My Great Aunt Marys are babushka-style old ladies who speak a strange language and offer homemade, ripened wine. Aghast at your skinny wrists, they will shake their head sadly before forcing you to consume munja (traditional paprika flavored lamb) and potato stew (cabbage stuffed with rice) or hopefully both. Arriving in Bitola is no walk in the park. 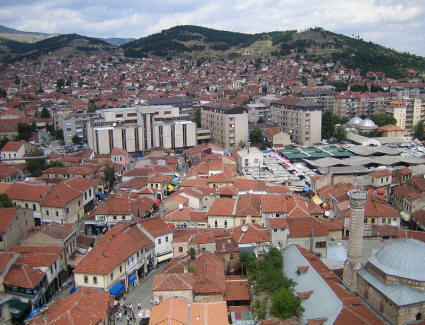 The easiest way to get there is to fly into the capital city of Skopje and drive a few hours south. I took what I thought would be a shortcut which involved flying into Thessaloniki, Greece, then hopping into a taxi for a two-and-a-half hour drive. As my driver hurled the car down the road at a frightening pace, he would occasionally point out the window to something noteworthy and mumble. Once he said, “Left – look!” and pointed to what was Pella (rumored to be the birthplace of the Macedonian conqueror Alexander the Great). For a country that produced famous stars of the Ancient world such as Alexander the Great and the bloodline of the Egyptian queen, Cleopatra, Macedonia does not dwell on its tourism. 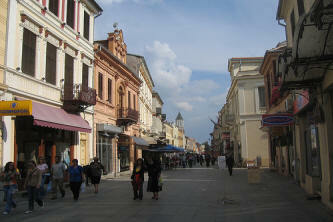 In fact, in Bitola, there is little tourism whatsoever. There are entrepreneurs and there are ideas, but there are minimal resources. The lack of tourism explains the lack of English which means that if you don’t learn a little Macedonian you’d better become fluent in expressive gestures. Locals would rather maintain their fruit trees and prepare for a cold winter than try to sell you postcards. As the European Union slowly gobbles up poorer countries, Macedonia’s entry is a long time off. Expectantly, their currency, the refreshingly pretty bank notes called denars, offer dirt cheap prices that resemble the Eastern Europe from a decade ago. The iron fist of Tito kept Macedonia strict: he was hostile to tourism and made it impossible for residents to leave. Fifty years ago a man and woman who were my grandparents did brave it past those German Shepards, barbed wire, and armed guards and snuck into Greece, eventually making their way to Australia. Unlike their Greek neighbors, Macedonians retain their own culture. Smoky cafes are frequented by Rakija drinking youth and burst with traditional — and often live — Macedonian music. Even though Bitola is Macedonia’s second biggest city, weddings are a joy and they are always a community affair. My Baba’s (grandmother) face lit up with joy as she described the festivities of a bygone Macedonia fifty years ago. “We were very poor, but if someone in the village had a wedding, oh, the feasts, the dancing! The whole village was invited!” A bride and groom celebrates nuptials with the community, and the community does not hold back; old ladies in their best suits toss coins and dance, and the youth drive by and honk their car horns. Bitola’s Shirok Sokak (humbly translated as “Wide Street”) is filled with internet cafes, dark inns, and street food vendors similar to gyros (yet slightly different to avoid confusion with their Greek counterpart). There is some mystery here. Bitola was chosen to represent old Russia in the film, “The Peacemaker,” yet juxtaposed with this Orthodox grandeur are the many tell tale signs of the Ottoman invasion such as the many marbled ceilinged mosques around town. My hotel, the Hotel Epinal, is on this main street. A five star hotel with a swimming pool, the hotel is out of place in Bitola. It doesn’t just seem out of place: it is. There are not as many souls staying here than working here. Everywhere you walk down the street there are looks. Bitola is such a small town that my Macedonian looks did not guise me; locals knew who is local and who is not. It’s impossible not to notice the beggars that are around town — including gypsies. Exotic eyes — some chocolate, others sea green — size up suitable targets before an emotional approach. Gypsy following fashionistas who call themselves “boho” would find their silk aqua skirt has no place around the torn fabric on tanned skin gypsies of Bitola. It wasn’t just the many homeless and beggars that I saw that tugged on my heartstrings, it was also seeing the tiny crumbling remains of my family roots. Had the man and woman who sneaked past the Greek border not been able to, they would have still lived at the crumbling stone cottage with an empty well. Jobs were either picking fruit or farming. If the fruit wasn’t ripe there was no income. Two apples fall from the same tree and suffer a very different life. The apple that produced fruitful things was my Macedonian grandmother, Blagga, who escaped to Australia. She learned English, had a family, was a fish and chip pioneer in the early 1970s, worked in a clothes factory, and (by Macedonian standards) was rich and very successful. The other apple, Blagga’s childhood friend Zoba, lived the life that my grandmother (and ultimately I) would live had she not escaped. She married, had six children, picked fruit every day of her life, drew her own water from a well, and lived in the same small house all her life. George, our taxi driver, drove to the Southwest so I could examine some of my old family houses. After passing two-storey brick houses and slum houses side by side, we found my grandmother’s childhood house: a mud and brick windowless hut. Granted, the dismal slum is on a lush grassy plain which looks up to surrounding mountains. Herethe air is fresh. The earby mountains — some spanning 6000 km above sea level — are snow capped even in the hot, dry summer.Next, I went to my grandfather’s cottage which was even more run down than the first, and it was covered in the inside by a thick veil of cobwebs. There was a keeper of the cottage: a matted dog who bared his teeth to ward off unwanted visitors. Ironically, these measures symbolized that the original occupant would never set foot there again. Having left illegally fifty years ago, my grandfather has never returned for fear that the Macedonian government would imprison him for illegal departure. In Macedonia, change happens very slowly or not at all. The third cottage we went to was Zoba’s cottage, and it was more intact than the rest. A little lady dressed in a thick Romanian headscarf was sweeping her already clean veranda when my grandmother approached her. Zoba gruffly asked, “Who are you and what do you want?” When my grandmother’s identity had been confirmed, Zoba cried disbelievingly, “You same Blagga as my child friend!” She embraced her lost friend then kissed me on both cheeks. She wiped her palms on her apron, lit a cigarette, and led me inside a tidy kitchen. She then fed me like a cattle going to be slaughtered as the two old ladies held hands and laughed at jokes. The charm of this old town is its people. Shop keepers are communicative and helpful and would risk their own financial detriment for a customer’s satisfaction. My sister made an unintended cheeky remark to one waiter. At the dinner table she tried to refuse a salad and said, “nesekum,” but with her pronunciation it sounded like she said, “nemesukus,” which means: “Do you not love me?” He laughed at her but looked happy that she at least tried. Another example was when a lady who worked at the hotel, unasked and begrudging of praise, not only laundered my clothes but also tightened a dress strap and sewed three buttons back on it for me. The Bitola International Museum is a run-down, two-storey building with a small etching on its facade announcing its name. The museum houses an amazing array of treasures. Inside are some of the oldest Greek and Macedonian treasures — relics associated with the age of Alexander the Great. Outside the museum there is what looks like nothing more than a small patch of old grass, but on closer inspection of the ground there’s actually a 3000-year-old Greek depiction of the ancient world. Just two kilometers out of Bitola is Heraclea, an ancient site in Macedonia that was founded in the 4th century B.C. by Philip II. Excavators have discovered many remains from when this ancient site was a Roman city including: baths, porticos and a theatre. Even more obscure and off the beaten track is the rarely mentioned, hardly known, city of Stobi. Once the largest Roman city outside of Rome, Stobi is like the lost city of Atlantis but submerged under dirt rather than water. A two-thousand-year-old past hides most of Stobi’s incomprehensible antiquities under brown dirt, but most people don’t know what treasure lies underground. 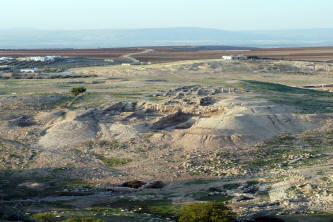 “If only,” thinks a Westerner as they envision excavations that would bring up mysteries of the Ancient World. Yet what is there to see is unmistakably dusty and casually awe inspiring. The buildings are there; high and proud, dusty and half unkempt, they are starved of attention. Even in peak season, there are no other souls (living that is) in this ancient city aside from the three lonely staffers working at the ticket kiosk. An echo will resound around ruins that stretch for kilometers. 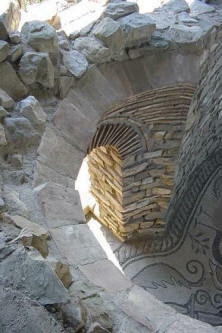 Colorful mosaics in the christening room that have weathered 2000 years are still bright with only a few missing tiles. High Roman ceilings are supported by marble pillars, and Stobi is magnificent, yet hauntingly vacant. Visiting there I felt like a trespasser in an amusement park wandering around after hours. Macedonians are loyal people and Bitola is full of them. For example, George, our taxi driver, loves his hometown and never wants to leave, though he admits that work is very slow. He has had offers from family abroad to sponsor him, but he is quite happy with his simple lifestyle. 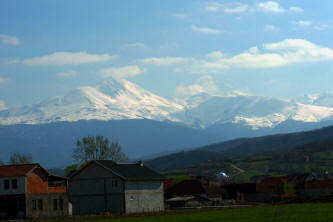 Macedonians may not have much, but what they do have they treat with pride and gratitude. An old man sells bureks, cheesy pies, and another man sells chestnuts; both treat their wares with the same respect as a celebrity chef. For the moment, Bitola seems safe from MacDonald’s. Enjoy it while it lasts.